blake runs – mostly marathons. usually in the morning. sometimes while pushing a kid or two. 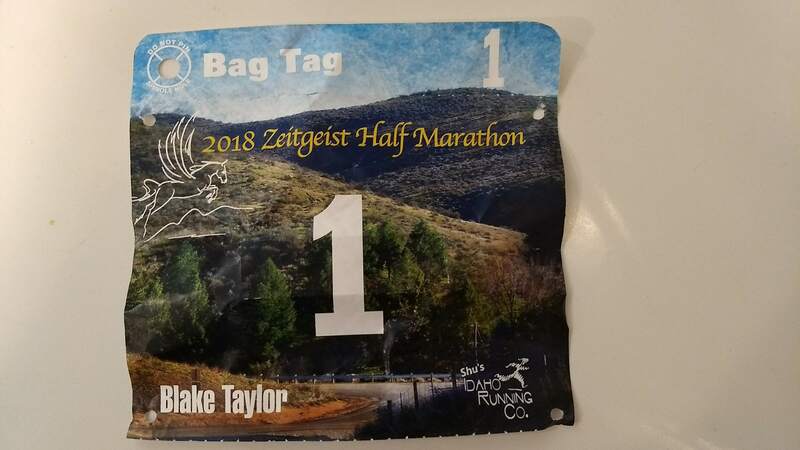 Today I ran the Zeitgeist Half Marathon for my 7th time. It’s a great race and I enjoy running it just about every year. This year I was joined by Cyndi, my father-in-law Jerry, my sister-in-law Kara, and our friend Joe. Cyndi ran with me last year when she was 4 weeks pregnant. We had our baby in July and Cyndi was able to run again this year just 3.5 months later. She’s pretty amazing. 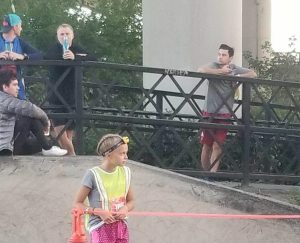 I wanted to continue my trend of Zeitgeist course PR’s this year, but I wasn’t sure if it was plausible since I ran in the SoJo Marathon two weeks ago. During the two intervening weeks I did my best to recover and maintain some speed, but my legs had felt tired ever since the marathon. The time for me to beat was 1:22:54 from last year. We arrived at about 9:15 for packet pickup. We picked up our numbers and I was happy to see that I got #1 again (probably because I got 2nd last year and 1st place wasn’t running again). It was chilly, but as the starting time drew near it warmed up. I ended up running in a tank top in weather that was ideal. We started right at 10am. I went out at ~5:50 pace and held a little under 6:00 for the first mile. There was one high school runner with me for part of it, but I didn’t think he would hang on for very long. After mile 1, another young looking runner caught me and passed me. He was another high school runner from Mtn Home. He and I ran together for a mile when another runner, Andrew, caught up to us. Those two charged ahead and beat me to the top of the first hill at mile 3.1. I didn’t want to burn out on hill. I sped up on the downhill and tried to push hard. I passed Andrew and then the MHHS runner and built a small lead as we headed through the flat portion in Hidden Springs. I tried to keep the speed up even on the flat portion and I was hitting about 6:00/mile, which was about my target pace for that portion. However, once we started up the little hill after mile 5, Andrew and MHHS runner passed me again. Evidently I just didn’t have the power for the hills like these guys. I hoped they would burn out later on in the race. Unfortunately they extended their lead to about 1 minute by the time we reached the top of the big hill. On the way up the hill I sneaked a few peaks to ensure that I didn’t have any runners coming up behind. I didn’t see anyone and I was feeling good enough that I figured I was in contention at least for a top three finish. Part of my plan to PR was to really attack the downhill, so once again I kept the effort up on the downhill to keep on PR pace and to try to close the gap with the two guys ahead of me. Due to the curves and the 1 minute lead, it was a couple minutes before I saw them. Eventually I could see that Andrew was extending his lead and I was gaining on MHHS ever so slightly. My first mile down the hill was at a 5:32 pace, and my next two were sub-6:00. I was very happy with that. The last downhill portion is 3 miles long. At mile 10 I estimated my finish time to be ~1:25, which was a little disappointing. I didn’t think I was that far off my PR time. But a mile later I realized that I was estimating my finish based on 7:00 miles (close to my marathon pace) instead of ~6:15 miles (my half marathon pace). I realized that a PR was possible. The course levels out at mile 11, but I was committed to a strong finish and a better place than 3rd if I could manage it. I was hurting but I ran the 12th and 13th mile at a 6:08 pace. I passed the MHHS runner when he paused for a drink at the last aid station. He sped up and caught back up to me but I could tell he was slowing down again. I put everything into trying to get a gap between us as I was worried he’d bury me in the last tiny but steep hill at mile 13. When I got to the hill I charged up and got light-headed. I then charged down into the finish (still light-headed) and ended up beating him by 40 seconds. I was very happy with my last 5 miles and with a course PR of 1:21:45, beating my next best time by 1:08. That was the strongest finish I’ve had at Zeitgeist, thanks largely to the MHHS competitor to push me. 1st place finished about 2 minutes ahead of me. He had an impressive last few miles. After chatting with some of the other finishers for 10-15 minutes, I doubled back on the course and did a cool-down to find my family. They all did well. 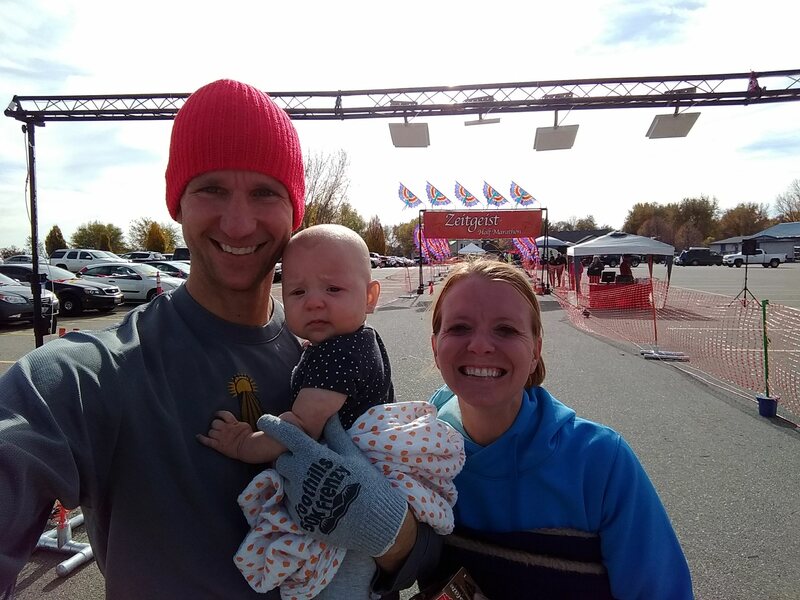 Cyndi ran the whole course (no walking on the hills) which was her goal, and quite a feat given our 3.5 month baby. Jerry got #1 for his age group, 70+. He was happy about that. I hope that I can still run when I’m 70+! He also beat Cyndi, which might be the last time that ever happens. At first I was a little disappointed that I had only gotten second. Part of that was that I was in first for part of the race and I thought I could break away, but then I got passed. However, I quickly became really happy with my performance. Last year (2017), I PR’d in every distance I ran, from the 5K to the marathon. This year I haven’t had a single PR, and I didn’t get a course PR at my other perennial run, Robie Creek. This race was a course PR which means that maybe I have improved a little over last year and all my hard work wasn’t for naught. Also, I’ve been feeling like I’ve lost the Eye of the Tiger, and my strong finish was something I could be proud of because it took some guts. It’s awesome to be able to look back and see the progress I’ve made after countless hours of running and many early mornings. I’m worried I’m plateauing, and until this race I thought maybe I had already peaked, but hopefully I can stave it off for another year or two and eek out a little more improvement. My wife and I had a baby over the summer so I didn’t sign up for any fall marathons due to schedule uncertainty. I kept up my training for the most part and stayed in good shape and injury free. As fall approached, I wanted to run a marathon to get another finish in the bag and test my fitness. I settled on the SoJo Marathon, located in South Jordan, Utah on October 20th. This would be a 5+ hour drive from my Idahome, but Idaho has slim pickings when it comes to marathons. The SoJo Marathon course looks pretty decent on a map, although I think it turned out to be more challenging than I expected. It starts at 5500 ft, then drops to ~5130 by mile 3, only to climb back up to 5500 by ~mile 6. Then there’s a bunch of downhill dropping all the way down to 4300 ft by the finish line, with an occasional roller mixed in. Packet pickup was available the evening before and the morning of the marathon, which was nice for those coming into South Jordan from out of town. There is also a half marathon, 5K, and kids run. I caught one of the buses on marathon morning to the starting line. The start was pretty laid back — located in a neighborhood next to a park. They had a couple heaters going in the ~40F weather. I was bundled up and feeling pretty well. I hoped for 2:55:00ish. My cousin happened to be doing this marathon, so I found her and we chatted for a while. This was her first. The SoJo Marathon started at 6:45. I took it easy on the first little uphill and tried to run loose on the downhill. It was steep enough that I focused on not restraining myself but also tried not to get caught up in the early race adrenaline. My initial miles were in the 6:30’s. I slowed down for mile 4 since I knew a hill was coming up. I had the unique experience of thinking I had just started mile 2 and then looking at my watch and seeing I was past mile 3. That’s never happened before. I met a nice guy named Josh Hernandez who was shooting for ~2:50. He was wearing a Boston shirt. We ran together for a mile or so and eventually he pulled ahead. I met another guy named Jon Harrison shortly after. He was shooting for a time similar to mine. He said he was mostly a trail runner and did Ultras. The hill was pretty large, although it wasn’t quite as bad as I expected. We had a headwind which I didn’t appreciate. I slowed down to almost an 8:00 pace for mile 6. I didn’t want to burn out early in the race. At mile 7 I believe my average pace was around 7:00/mile, which seemed about right. Josh and Jon both pulled ahead of me. Then the downhill really started. It was really steep at first and I took advantage of it. I passed Jon back up on the steep part. Then it was a gradual downhill which was pleasant to run in. I saw some deer which is always nice during a race. Through mile 10 we were in the outskirts of the city. Right at mile 10 the SoJo Marathon took a left turn and started a series of turns on big roads in the city. Mile 10 was the most poorly marked turn, but the course was well marked in general. Now the SoJo Marathon course settled down and was pretty flat. The big, long roads were somewhat monotonous, but I was feeling pretty good and staying positive. It was nice to pass half way, and I did so in about 1:29:30. This was a little disappointing as I wasn’t feeling that a negative split would be very feasible. My plan had been to be somewhat conservative for the first half and then see what I could do the second half. I didn’t feel like I had been overly conservative. Josh was now out of sight and I figured he was on his way to low 2:50’s. Mile 16 had a decent drop which I utilized to run a 6:36. During mile 17 we passed the Oquirrh Mountain Utah Temple. It’s situated right on a hill, which meant we also got to go up a steep hill. I passed a marathoner right at the bottom of the hill who struggling. At the start he said he was going for 2:50, but I think this was his first marathon and he was a little unprepared. Oops. Been there, done that. The ~75 foot hill was a challenge, but at least we got to run down it as well. However, on the way down my legs weren’t quite moving like I wanted them to. Thus began a slow slide into the wall. There was a very gradual hill during mile 20 which again slowed me down, and around this time another runner passed me. I ran with him for a bit and it was nice to talk to someone at least. But I was dragging more and more and I told him to not let me slow him down. Luckily there was more downhill during miles 23 and 24 because I was starting to hurt. I was definitely hitting the wall and watching my shot at even a sub 3:00 slip away. It was disappointing, but there wasn’t a lot I could do. At mile 25 we entered a running path. I was passed by a few more runners, including the top female with about a mile to go. I held on pretty well but I was really looking forward to the finish line when it finally came. Is there anything more relieving than crossing the finish line of a marathon? It felt so good to stop running. Official time was 3:02:59, which earned me 11th place. I was pretty disappointed with my time. I really thought I was capable of 2:55, and that I had a shot at 2:50. I’m not sure what went wrong. Sleep was good, nutrition was ok, training was good. I think I may have underestimated the course difficulty. Josh and Jon both ended up finishing just a minute or two ahead of me. I think my time will be good enough for Boston 2020, but it might be right on the edge, so I can’t depend on it (I’m not sure I’ll want to run it anyways). I still did get another marathon under my belt and it’s always a good experience to run it and finish, even if it’s not what I hoped. The SoJo Marathon organization was good. The first half of the course had some great views, including sunrise over the city. The second half was nothing to get excited about. I think the only reason I’d run it in the future is if the timing is just right. That said, I’m still glad I ran it. It was my 21st lifetime marathon/50k and my second this year. Before this year, my father-in-law had run in the Hood to Coast Relay 19 times. His birthday is in late August, which is right around the time Hood to Coast takes place. 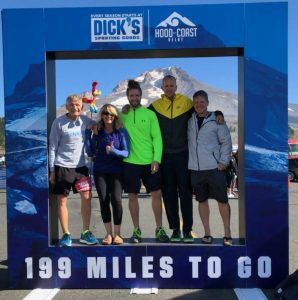 So this year he put together a family team for his 70th birthday and 20th Hood to Coast. I got to run Leg 5 and I had a great time! 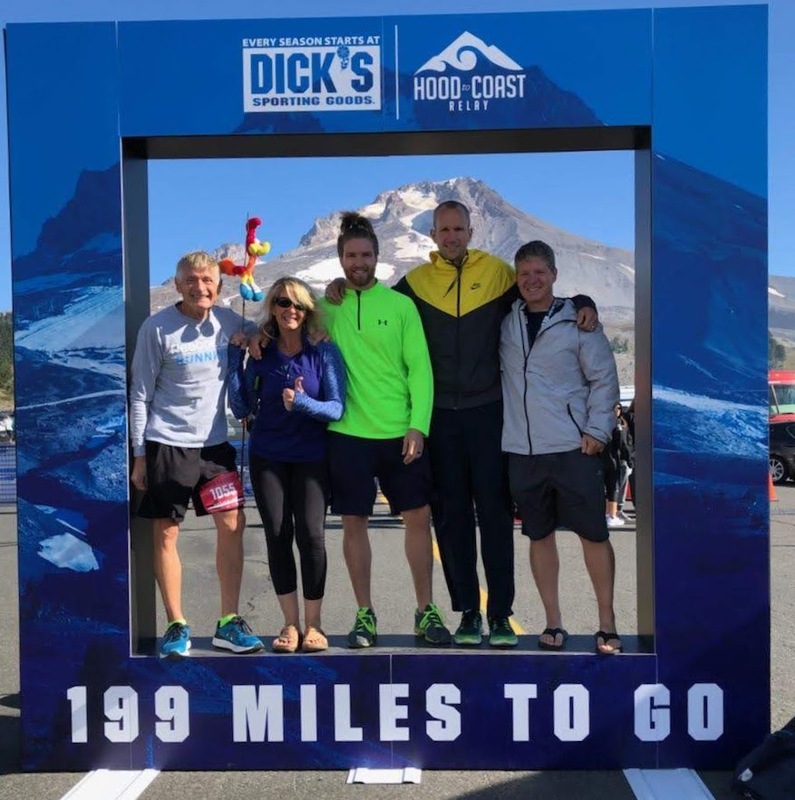 Hood to Coast is a 199 mile relay that begins at the base of Mt Hood and ends in Seaside, OR. 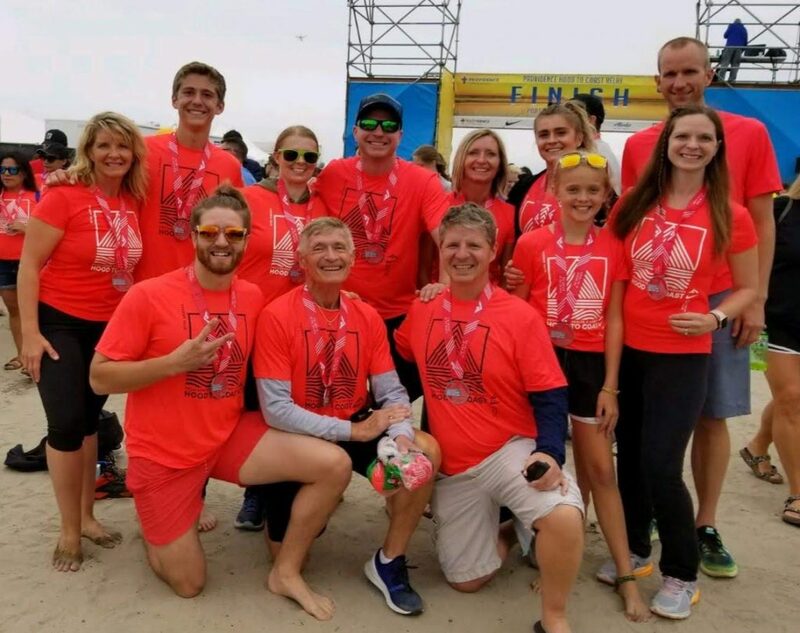 It starts with some steep downhill on a highway in the forest, continues through some smaller towns amidst farmland, then into Portland, along the Columbia River, through windy forest roads, and finally onto the finish line at the beach. Hood to Coast is truly the “mother of all relays”. It boasts 1200 teams, and triple that many team applications. It has some elite teams sponsored by Nike and others that finish at just over 5:00/mile pace. Hood to Coast is the relay that inspired the creators of the Ragnar relays. 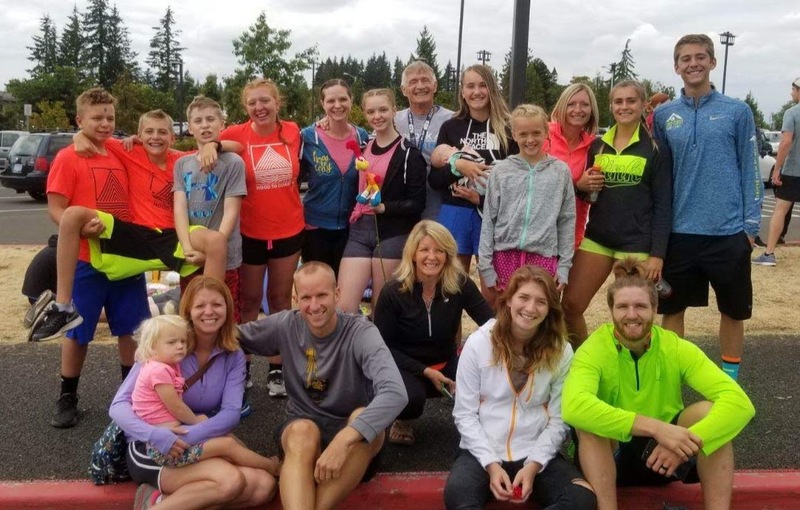 Our kids had already started school before the race, so we waited until Thursday after school to head from Idaho to the Portland area to meet up with family. The drive went pretty well and we pulled into town around 11pm, so we basically went right to bed. The next morning we woke up and I hopped in with Van 1 to head to Mt. Hood. It was quite chilly and breezy at the base of Mt. Hood, but it was a fun atmosphere. This was my 4th big road relay, but it was my first time in Van 1. It was great to be there at the start as we started our journey across a large chunk of Oregon. My father-in-law, Jerry, ran Leg 1. Jerry handed off to Cyndi for Leg 2. The first few legs of Hood to Coast are pretty steep downhill. However, I was running Leg 5 which had a decent amount of uphill to it. I was targeting a ~6:30 pace for the whole race, so I figured I might take it easy on my first leg. I ended up feeling pretty good and hitting a 6:23 pace. All three of our volunteers were on my leg, so that was pretty fun. Two of them were handing out water and the third was at Exchange 5. Overall it was a nice first leg. I handed off to Monte, who was 2-3 minutes late to the exchange thanks to a long line of traffic. I promptly drank my first chocolate milk, which I now believe is the secret to keeping my stomach calm during a relay. We met up with Van 2 at Exchange 6. They were excited to be starting their first legs. We had some spectators who met us there as well. Also, we substituted a few runners in and out. Since it was Jerry’s 70th birthday, he wanted to give a some of his 34 (?) grandkids an opportunity to run, and they couldn’t all handle three legs. Also, Cyndi had just delivered a baby ~7 weeks earlier, so she only ran one leg. This isn’t exactly up to regulation, but we weren’t exactly a competitive team. Van 1 stopped for a while at a nearby Wendy’s and we met up with our volunteers there. My daughter, Paisley, was now in the van in Cyndi’s place, and we each had a baked potato. That was probably the nicest meal I’ve ever had during a road relay. After relaxing for a while, we endured rush hour traffic through Portland to get to Exchange 12. Paisley would be running Leg 13, but since it’s on the river front (with a river front type of crowd mulling around) and it would be getting dark, I ran with her for her 4+ miles. It was a nice and easy pace, so it felt pretty good. She was super nervous to take the hand off in front of the big Exchange 12 crowd under the overpass. She had a nice finish and was really excited to be part of the relay team. I gobbled a Kind bar and a breakfast bar to refuel before my next run. Jerry ran Leg 14, then Tyrel ran Leg 15, then Christy ran leg 16. 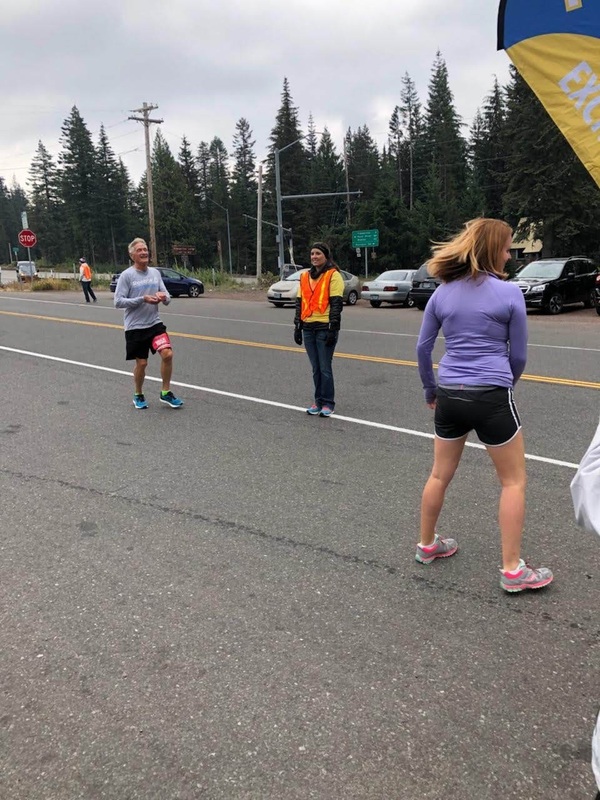 The Hood to Coast traffic was starting to back up considerably at some of the exchanges. We had to wait a long time before Christy could get out of the van to meet Tyrel. It was back to me for Leg 17. While I was waiting in line at the Honey Bucket, I had a nice conversation with a Marathon Maniac. He said he was getting too old to run, and he had lost count of how many marathons he’d done. I was a little nervous for my third run in the last 12 or hours. It would be my longest, and I wasn’t sure how fast I’d be able to go. Fortunately it was a nice temperature with little wind and I ended up feeling just fine. I went faster than expected — hitting 6:10/mile (excluding the annoying 37 second stop I had to make at a crosswalk right before the end). At this point I really wanted to take a shower, and there was one at this exchange, but we had to move to Exchange 18. It annoyed me that all the showers were basically unavailable to the 5th and 6th runner in Van 1. I don’t remember Exchange 18 very well, except that Van 2 complained that we had kept them awake by texting at each of our exchanges. I asked them if they were familiar with “airplane mode” and I also reminded them that at Exchange 6 they had complained that we didn’t give them enough information. It was pretty funny to me, although I do feel bad they didn’t get to sleep as much as expected. We made the drive to exchange 24. When we got there we were all very tired. It was foggy and dark and this would be our one chance to sleep. We had planned on having a big tent set up, but there was a miscommunication and it didn’t work out. I ended up just placing a tarp on the ground and rolling out my pad and sleeping bag on top of it. None of the other people in my car came with me, so I just set my alarm to make sure I could find them before it was time to go. There was some risk of getting lost in this huge, dark exchange. I was able to get a couple hours of decent and much needed sleep when it came time to wake up. I went to the car and found the rest of our runners packed inside. In a previous relay race I learned that sleeping with everyone in the car is a bad idea, so I’m glad I wasn’t squished in there as well. Eventually our other van arrived and we found them despite the lack of cell phone reception. I didn’t even see their runner come in because I was getting ready to get back in the car. Christy started running just before 6am, right as dawn approached. Jerry and Tyrel both ran about 6 miles. Traffic was getting bad, and Jerry had to wait a few minutes for Tyrel to use the Honey Bucket. Tyrel had a strong run and passed loads of runners that were slowing down on their final leg. Paisley went really fast on her run, and traffic was such that I jogged the last half mile with her at a 7:30 pace. I then reset my watch and headed out for Leg 29, my most challenging leg: a 6 mile run with 566 ft vertical. I hit it really hard. I was trying to pass as many people as possible to keep up with all the people Tyrel passed, but that didn’t happen. I passed a couple dozen people, but overall everyone was pushing hard up the hill. At the top of the hill there was a small of people cheering, including my van. That made this leg extra fun. I pushed hard down the hill as well and I came in at a 6:11 pace, which I was very happy with. Monte took the baton and our van headed to the last big exchange before the finish. There were tons of people, and we had been running faster than expected, so we spread out to find our other van and give them a heads up. I eventually found them and they were surprised to see us. They had been battling traffic and had only been at the exchange for 30 minutes or so, so they weren’t thrilled to see us. They got going and Van 1 was very happy to be done. Some of us took a much needed shower at Seaside and then spent some time at the beach waiting for our team. We all finished together and we celebrated with a delicious seafood lunch. Don’t try to sleep in the van at major exchanges. Bring a sleeping bag and use it. Relays aren’t exactly my favorite type of race, but they can definitely be fun and challenging. I’m sure I’ll do more in the future, and I hope Hood 2 Coast is included in that.